Enjoy the Criterion Hotel in Oamaru : it’s a beautiful historic Victorian hotel built in 1877 and is centrally located in town. This hotel has been restored to high standards, and it is now a resplendent hotel (bed and breakfast). Within its premises, it has a bar, snug and comfortable accommodation all decked out in Victorian splendor. For their bed and breakfast accommodation, there are twin sharing rooms, double rooms and queen bed (with ensuite facilities) available from NZD80 to NZ160 (about USD50 to USD100) per night. All the prices include cooked or continental breakfast. For the cooked breakfast you can expect bacon and eggs, jams and toast all in the old Kiwi style. Offstreet parking is available. There are full bar facilities available and you will be able to sample the wide range of Central Otago wines and local boutique beers. The private full bar facilities can cater for small to medium size functions. 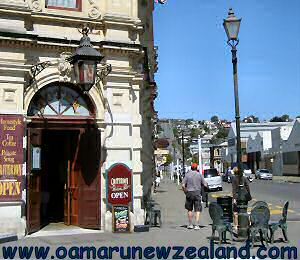 As the Criterion Hotel Oamaru is located in the central historic precinct (read more in Oamaru attractions), it is within walking distance to the harbor and also to one of Oamaru’s top local attraction which is the blue penguin conservation centre.